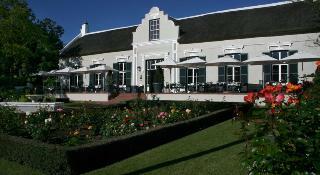 Situated in Drakenstein valley, the hotel is located 5.5 km away from the Taal Monument. It is less than 10 minutes' drive to Paarl town centre's local delis and shops. The nearest bus stop and railway station can be reached in around 2 to 3 minutes by car, and the beach is about a 1-hour drive from this charming hotel.The hotel offers a lounge bar with a world-class cigar selection. It has underfloor heating and a TV with access to multilingual channels. In the area surrounding the hotel, guests can cycle along Paarl's historic trails or go hot air ballooning or on a helicopter flight. Guests are welcomed in the air-conditioned hotel's lobby at its 24-hour reception which also offers a 24-hour check-out service. A hotel safe is provided, and food is served at the restaurant. Business travellers will appreciate the conference facilities provided and guests can stay connected thanks to the wireless Internet access on offer. Guests can also take advantage of the room and laundry services provided at this hotel, and can leave their vehicles at the car park.The en suite rooms feature a shower, bath and hairdryer. A double or king-size bed comes as standard, as does a telephone and satellite/cable TV. Guests can take advantage of their room's Internet access or listen to the radio. A safe and minibar are also provided, as are tea and coffee making facilities. Individually regulated air conditioning features in all rooms, as does a terrace.